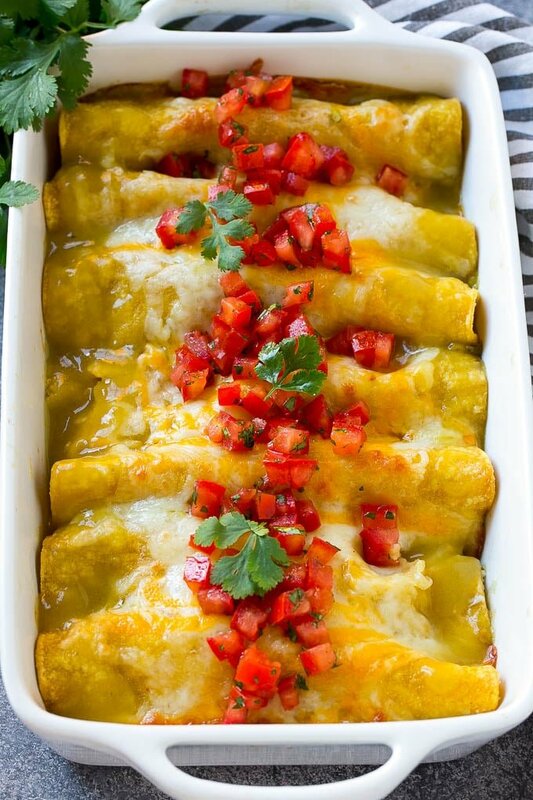 These green chile chicken enchiladas are made with shredded chicken and plenty of cheese, all rolled up in corn tortillas and smothered with green chile sauce. This enchilada recipe is sure to become a family favorite! Making enchiladas at home is actually quite easy to do! These green chicken enchiladas taste like they came from a restaurant and are the perfect way to use up leftover chicken. 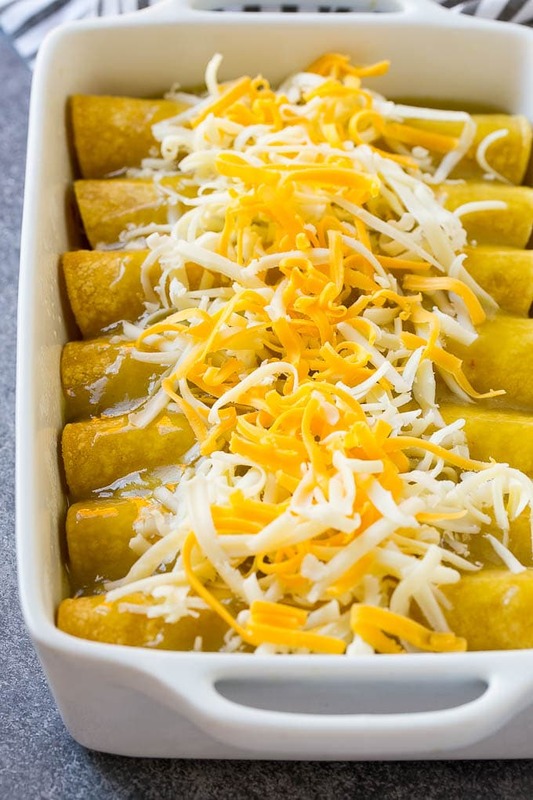 I happen to be an enchilada lover – cheese, beef, chicken, I love ’em all! These green chile chicken enchiladas are ready in less than an hour and are loaded with cheese, chicken and chiles. My family requests this dish constantly, it’s just that good! 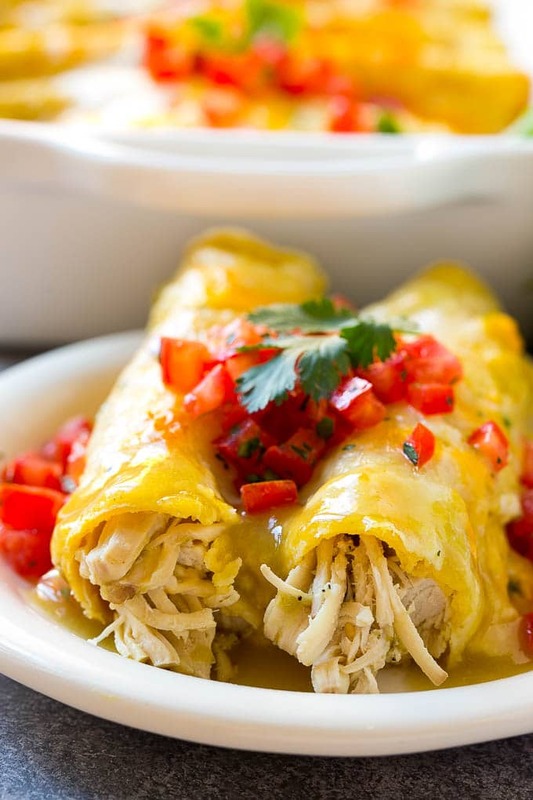 These green enchiladas start with cooked, shredded chicken. You can use leftover chicken, a rotisserie chicken, or cook up some fresh chicken breasts. I sometimes put some chicken breasts in the slow cooker with a cup of green salsa, then cook on low for 6 hours and shred the meat. The chicken is combined with green chiles, spices and and cheese, then rolled up with a little sour cream into the tortillas. I use corn tortillas here because it’s more traditional, but you can absolutely substitute flour tortillas if you prefer. The tortillas need to be softened before you roll them up, otherwise they’ll break or crack. Some people dip their tortillas in hot oil to soften, but I’ve found the easiest way to do this is to give the tortillas a good steam in the microwave. After the enchiladas are rolled up, they’re coated in sauce and topped with cheese before they go into the oven. I use store bought green enchilada sauce here, because I find that I simply don’t have the time to make my own sauce most of the time! 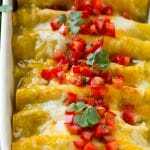 You can make these enchiladas as mild or as spicy as you like by selecting a sauce and can of chiles with the heat content that you’re looking for. I use mild sauce and mild chiles because I’m feeding kids, but if you like spicy, switch to a hot enchilada sauce or chiles. After the enchiladas take a trip through the oven, I top them with a little diced tomato and cilantro for added freshness. I serve these green chile chicken enchiladas with our favorite Mexican rice and beans for an amazingly delicious dinner that my whole family enjoys. Preheat the oven to 375 degrees. Coat a 9"x13" pan with cooking spray. In a medium bowl, mix together the monterey jack and cheddar cheeses. In a large bowl, mix together the chicken, 1/2 of the cheese, green chilies, garlic powder, cumin, onion powder and salt and pepper to taste. Stack the tortillas on a plate and wrap with a damp paper towel. Microwave for 1 minute until tortillas are warm and pliable. Lay one of the tortillas on a flat surface and spread approximately 2 teaspoons of sour cream down the center of each tortilla. Add approximately 1/3 cup of the chicken mixture, then tightly roll up the tortilla and place it seam side down in the pan. Pour the enchilada sauce over the top of the pan, the top the enchiladas with the remaining cheese. Bake for 20 minutes or until cheese is melted. Serve, topped with chopped cilantro and tomatoes if desired. I typically use rotisserie chicken in these enchiladas to make life easier, but leftover chicken also works great! I like my enchiladas on the mild side; if you like things spicy, use a can of diced jalapenos instead of the green chiles, or go for a hotter enchilada sauce. So happy to hear that they are your favorite, thanks for reporting back! Can these be made up and kept in refrigerator the day before serving. Yes that should work just fine, just keep in m ind that the tortillas will soften as they absorb the sauce! Do you cover when you bake them? These have become a family favorite! I love this recipe! Always corn tortillas in this house for enchiladas and served with beans and rice plus a salad for the meal. Sometimes I use softened cream cheese mixed with the sour cream for extra creaminess. Also been known to mix in a can of cream of chicken soup with the sour cream/cream cheese with some of this mixture saved and added to the salsa verde over the top before baking. I detest dry enchiladas. Would this recipe work with carne asada subbed for chicken? ( that is what I happen to have on hand). Has anyone tried that combo? I’m Celiac/GF and this looks delicious! Yes that will absolutely work! OMG I havent had enchiladas in a while. These look delish I would love to try this. I absolutely love enchiladas. I have never made them at home however and would love to give this a shot! I absolutely LOVE making enchiladas. I haven’t made them in a few months and really need to add them to the dinner list! I’ll take TWO pans, please! ha! But seriously though, these look amazing with all that gooey cheese on top. Oh my gosh, these look SO good. This reminds me, I need to get some chicken to make these one night this week! My mom made these when I was growing up and it was always my favorite meal. She still makes them but only on special occasions and I always look forward to it! We love chicken enchiladas in our house, although we haven’t tried adding green chiles in them. This sounds delicious! 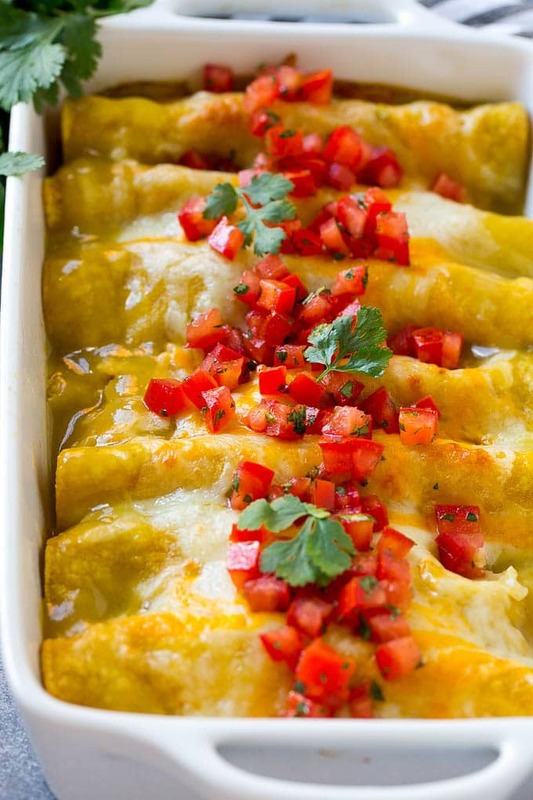 enchiladas are one of my favorites! I’ll be testing out this recipe soon. It looks wonderful! Such an easy dinner idea, love that! Mexican is always a fave in our house especially enchiladas. I need to try this green version! Enchiladas are always a hit with my littles and I agree, corn tortillas is the way to go! I love your slow cooker method with the cup of green salsa, to prep the chicken. Sound delicious in and of itself. This entire dish looks fabulous! I have made beef enchiladas and I have made cheese too. I have never tried chicken. I bet the kids would like it! 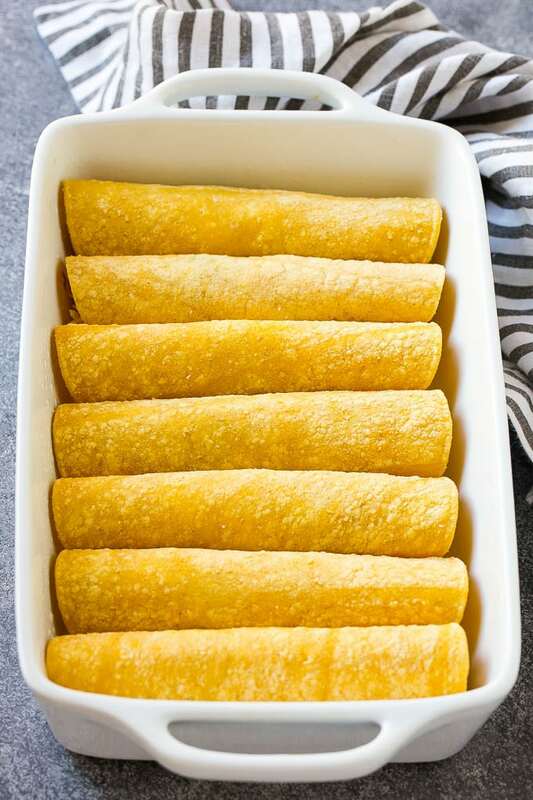 I’ve always used flour tortillas for my enchiladas, but you have me sold on trying this recipe with the corn tortillas. This looks so tasty. I think it would be a great addition to our Cindo de Mayo buffet this year!